Went to the eye doctor the other day for my yearly exam. I can tell that I needed new glasses. I have been wearing the same frames since 2011-just changing the lens when I needed a new prescription. My doctor and I are about the same age and we shoot the sh*t while I'm there and talk smack about the medical profession and its stupidities. He could tell I was stressing out while I was trying to read the blurry letters on the far wall. He told me that I HAD to order this particular book that he thinks is fabulous. He told me that if I didn't like it, he would pay me the money I spent on it. What's the title you say? "The Life Changing Magic Of Not Giving A F*ck." So yeah, I trust and like my eye doctor so I ordered it right up after I left his office. I have it in my possession, but have not finished it yet. I just think the title alone is hilarious and yeah I admit, I stress out about too many things that just don't matter. Oh and I picked out new glasses! The pair I've been wearing has blue filigree on the side pieces and has very small lenses. 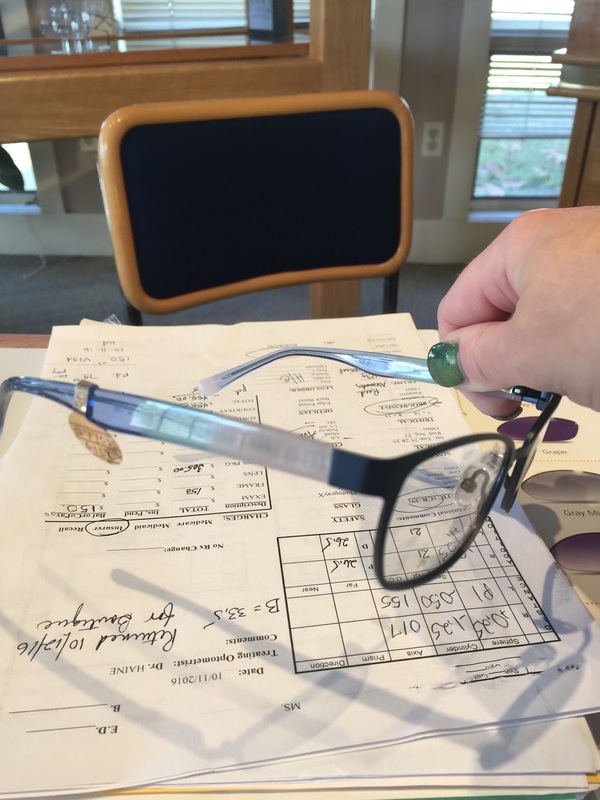 Since I've had to switch to progressive lenses, I really needed a larger lens so I can see better as I'm having a hard time training my eyes where to look for close up vision. Me and the glasses lady went through over thirty pairs of different glasses. I finally managed to get it down to one pair. I don't have them yet, but here's a picture I took of the sample pair in the office. See the blue ombre on the sides? The frames themselves are a brushed matte dark blue and since my eyes are blue, it makes them pop big time. I can't wait to get them! Just wish I didn't have to pay almost $500 for them! That's a big fat ouch right there. But I need them and haven't had new frames in five years so will see if I can get this pair to last that long! Still waiting to get my car fixed. Haven't gotten the check yet from my insurance. It's really starting to piss me off. I keep emailing the guy. Stuff like haven't gotten it today. Nope not today either. On the daily I send him an email. Tomorrow I plan to call him and be like WTF dude? All right. 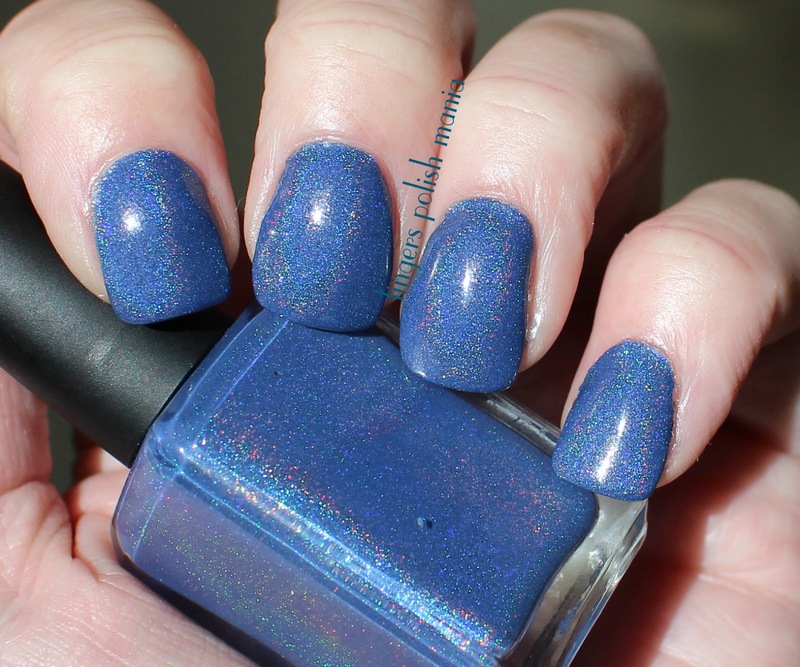 Here is the next stunner from Enchanted Polish. This is Bewitched. Goes with my new glasses doesn't it??? This is a gorgeous cornflower blue with a subtle holoness to it. I really like this one too!